I dropped slime on my carpet – and my kid saw the whole thing. It happened right in the middle of our living room. We were making homemade slime, everybody’s favorite non-Newtonian fluid, and right after I asked my son to avoid making a mess, I knocked the bowl off the table and directly onto the living room floor. Egg on my face and slime in my carpet! Naturally, my kid thought this was poetic justice incarnate – and the funniest thing he’s ever seen. As he was laughing, however, I was dialing the phone. I had a very pressing need to find out how to get slime out of carpet, and I knew exactly who could help. You see, I happen to work for the best carpet cleaning company in Michigan, and I happen to know the foremost authority on carpet spots and stains: Tom! Get your vacuum out and vacuum up as much of the surrounding area as possible. In a spray bottle, combine 1 part white vinegar to 3 parts water. Spray your white vinegar solution on the slime and allow it to soak into the carpet fibers. Using clean white towels or paper towels, blot (don’t rub!) the slime until it’s completely removed from the carpet. Repeat steps 4 and 5 if necessary! If there’s a stain left after all the slime is removed, apply your citrus cleaner and allow it to soak into the area. Rinse the spot with a small amount of hot water, but don’t saturate the carpet! With your clean white/paper towels, blot until the stain is gone and the area is dry. Again, repeat the last two steps if necessary! If following the above steps fail to remove the slime stain, then it’s time to call in the experts who know exactly how to get slime out of carpet with state-of-the-art equipment – you’ve done all you can do by yourself, now let the professionals take care of your carpet problem. We’ve dealt with all kinds of carpet stains, and our 100% Customer Satisfaction Guarantee means you can be confident you’re getting the best possible carpet cleaning. I’ll admit, slime is super fun. After we took care of the slimed carpet (I had my son do the blotting), we mixed up a new batch and stretched, poked, squeezed, and prodded to our hearts’ content – in the kitchen this time, over some easy-to-clean tile. Modernistic has been cleaning up the messes Michigan kids have made for the last 45+ years! 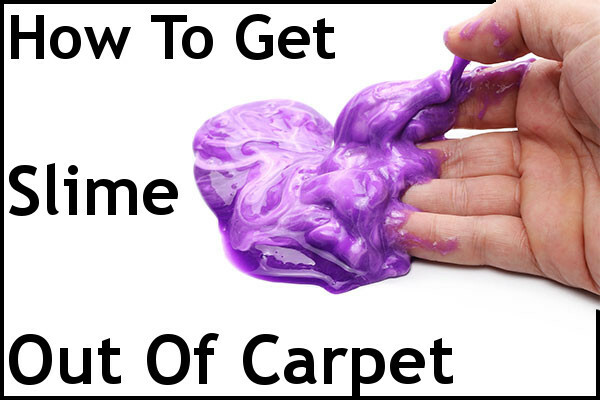 Call or click today if you’ve had a slime (or any other type of carpet) catastrophe.